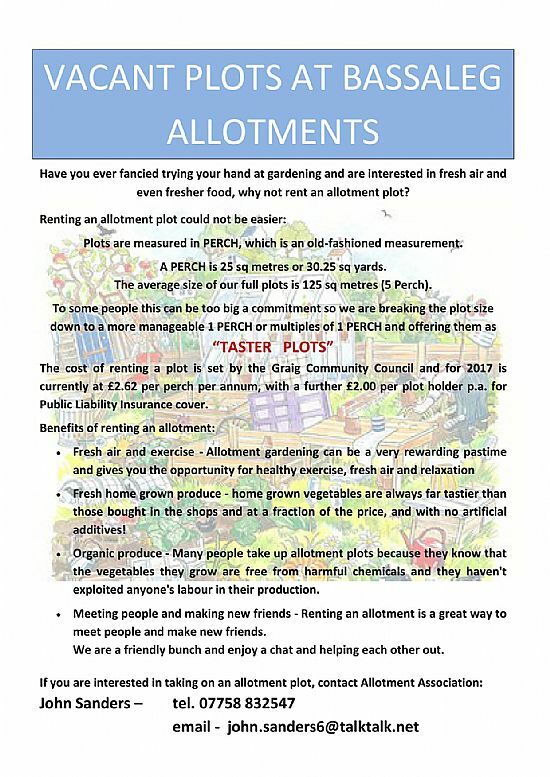 The allotment site currently has some plots available for Graig ward residents to rent, if you are interested please contact Claire Seyler using the details below. The Community Council is responsible for overseeing the Bassaleg allotment site. The site is situated between Caerphilly Road and The Griffin in Bassaleg. This has been an allotment site for many years, the current site holds 45 plots varying in size from 1.5 perch to 10.4 perch, the average size being around 5 perch. The current rental rate is £2.75 per perch. The Community Council offers a 50% reduction for plot holders over the age of 65. Previously the site covered the whole area of the current site, the open green space alongside it and the land on which the Graig Community Hall now stands. In the past allotment gardening was seen as a necessity, but these days is seen more as a relaxing pastime or hobby and a way to keep fit - it should not be underestimated how much effort and dedication is needed to properly work a plot. 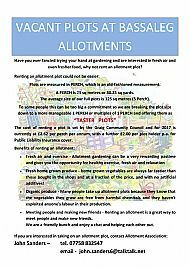 The site is run day to day by the Bassaleg Allotment Association. The Community Council oversees the running of the site and provides basic amenities such as water and skips as necessary. Council inspects the site twice per year to ensure standards are being maintained and will issue warnings to plot holders if necessary. If you have any queries regarding the site, or if you wish to be considered for renting an allotment plot, please contact the Secretary using the details below. Presently, there is a short waiting list.